In January 2016, TxLips (Translation: two lips) was born. 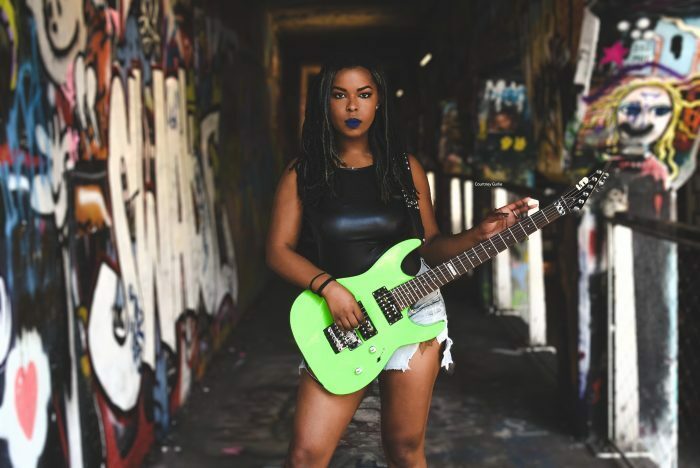 This band recently came on my radar, as “Black Women IN Rock to watch.” TxLips, founder, and guitarist, Gabriella Logan – a.k.a. 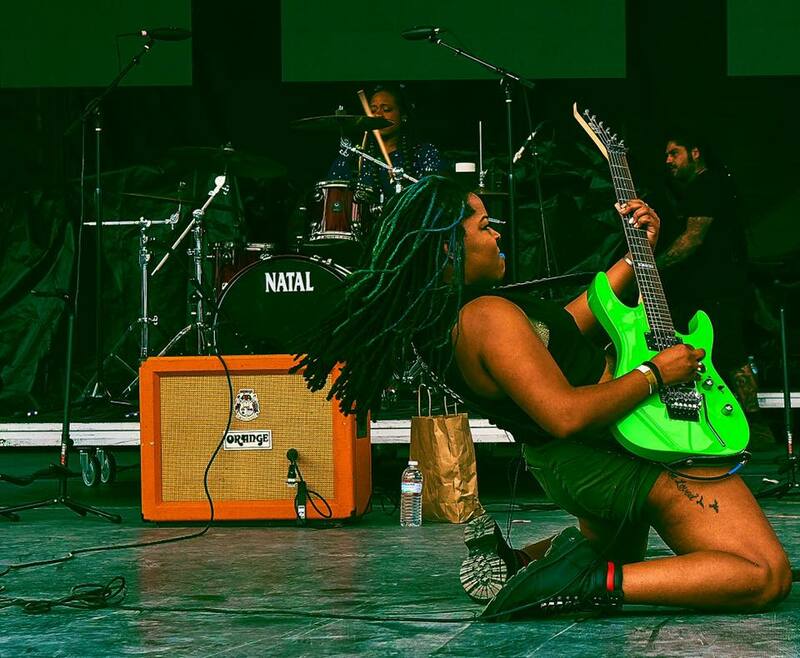 “Guitar Gabby” – is on a mission to elevate Black female musicians in the world of rock. We are definitely on the same vibrational frequency! So here we go….5 questions and 5LBS. Of ROCK. SHEILA: Atlanta has a strong hip-hop scene. 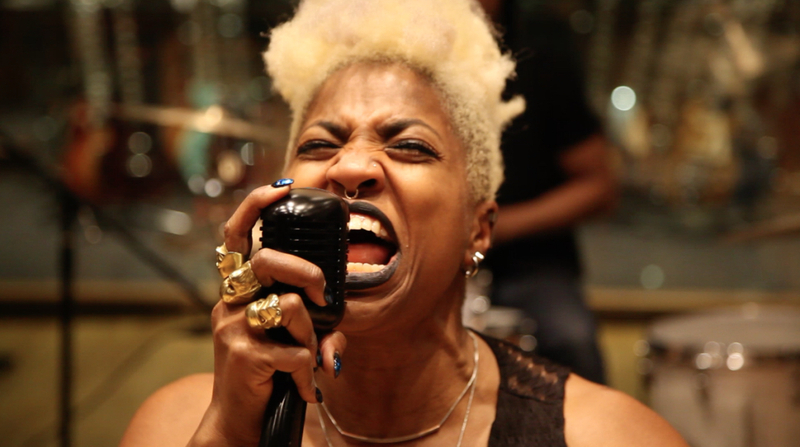 What’s it like being a Black Woman IN Rock in Atlanta? Do you feel more challenged being in a southern city? GABBY: So when I started this band I anticipated that I might receive a lot of the same kind of pushback that I did when I was in high school. I thought maybe they wouldn’t like it. But ironically most of our fan base is white women. With the Black community, at first we’d get that, “Why are you all playing white people’s music?” But the fact is that we’re Black women and we don’t take “no” for an answer. We know who we are and we’re very confident in our music, and will go forward no matter what. I’ve noticed that a lot of people from The Rock Community and The Hip Hop Community are starting to cross-over and intertwine themselves. A lot of hip-hop artists who are coming up now kind of want to have a little bit of rock edge. That’s actually how we got started – playing for a rapper. Now a lot of black rappers invite us to open their shows because we’re Black and we’re women. It gives them that edge that they want to be connected to. SHEILA: So how did the vision for TxLips begin? GABBY: I met my drummer, Monique Williams, a.k.a. Mo (pictured below), when the rapper, Diamond (Crime Mob) asked me to do her music video. I asked Mo to participate in the video as well, because they wanted an all girl band for her shoot. I took the opportunity to further that by creating Txlips. Mo is the most consistent and supportive member. I have a vision to fulfill and a desire to push Black Women in rock n roll, playing instruments. I always prefer the same people for consistency and cohesiveness. However, I had to understand that people have their own musical endeavors. So instead of traditional “members,” I have subcontracted musicians, with the stipulation being they must be Black Women. Currently, Dara Carter (on keys) and Maria Montgomery (on bass) both came to Txlips because they wanted to engage and participate in empowering Women in rock n’ roll. 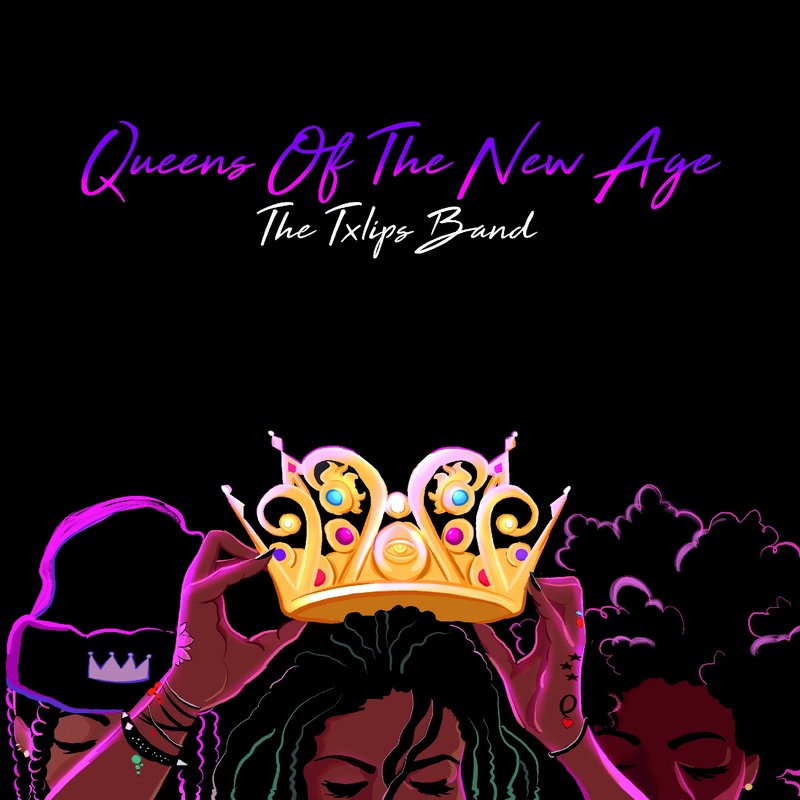 SHEILA: I want readers to know about your new EP, Queens of The New Age. It’s available on Spotify, Tidal, Apple Music and everywhere music is sold under “The Txlips Band”. . .and I love it! SHEILA: What can audiences expect when they see TxLips perform? GABBY: A Diverse Rock Experience. That’s one of the things I love about our band. We are very diverse in how we play our instruments. I’m rock-based, because that’s what I grew up listening to. But my bassist, she’s more into funk, that’s how she grew up. My drummer, she grew up playing jazz. But when we bring it all together you can hear the individual creativity coming through. The music has that rock consistency, but you can always hear the diversity. SHEILA: So who writes the music? GABBY: I write all of it. The music that I write is coming from experience. But I also try to make it a point that everyone, no matter who you are – whether you are part of the LGBTQIA community, whether you are coming from a white community, or wherever you’re coming from – it’s something that you can relate to and you can understand it. SHEILA: So there’s obviously something about how you express yourself in this music that appeals to Black women. What do you think that is? 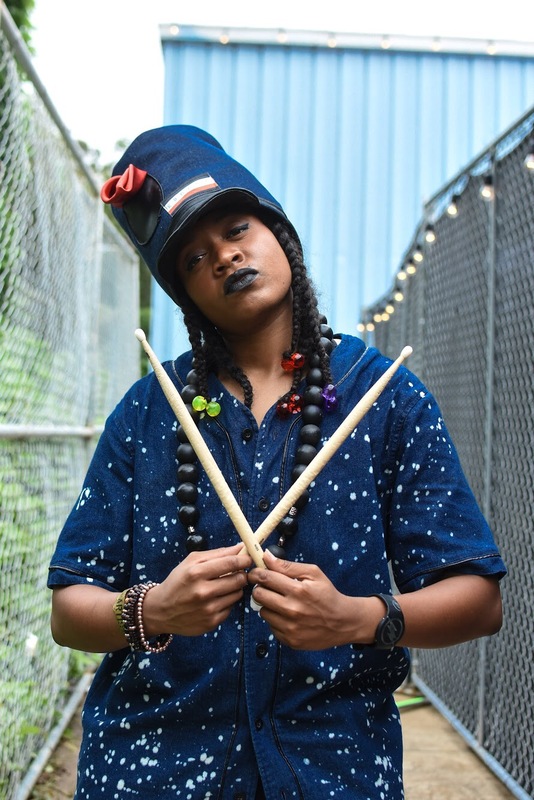 GABBY: I think a lot of the cool factor is that we represent different types of black women – from our individual styles, our attitudes, our hair, to the instruments were playing. Actually we opened up for the Indigo Girls recently, and there were a couple of Black women in the audience. One of them came up to us after the show and said that she was almost in tears, because she was in another room, heard music, and she came out and saw someone that looks like her. She said that she didn’t know that ‘that’ was a thing. Those were her exact words. And that right there…it touched all of our hearts. To represent Black women and be in this capacity, to play in this world of Rock, to be in the forefront trying to lead and carry the torch, is something that is very important to me. We definitely represent the diversity that Black women are because none of us is the same.